The first ever account of how the New Zealand All Blacks have dominated the game of rugby, and what lessons we can learn from them about how to achieve excellence in all fields. New Zealand rugby is a dynasty that has transcended all national barriers. As a culture and a model of how to play the game, be consistently successful yet do so with the essential trait of humility, world rugby has looked to the New Zealand model for guidance.Traditionally, the renowned All Blacks and those charged with guiding them have kept close to their chest the rules of engagement they live by and which have led them to three Rugby World Cups and the accolade of being probably the greatest team in the history of sport. As the build-up and planning began towards the Lions Series in 2017 and Rugby World Cup 2019 in Japan, New Zealand Rugby agreed to open their doors to rugby writer Peter Bills to consider the reasons behind their dominance of the world game through the ages. Officials, coaches and players plus people involved in all elements of rugby right across New Zealand talked candidly to the author to outline views for their success. 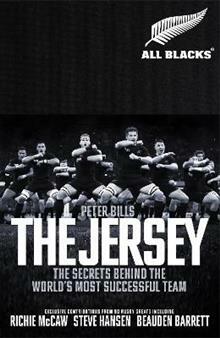 The Jersey will explore an extraordinary story with unprecedented access and insight.Through this book, for which Peter Bills has been given unprecedented access, readers, supporters and administrators of the game worldwide will understand some of the basic requirements and immense challenges required, not only to become No. 1 in the world but remain at the top consistently.The New Zealand All Blacks have set the bar as to how not only to play rugby, but play as a team while excelling at an individual level. The lessons to learnt from how they achieved such unprecedented continuous success is something that all of us, from every walk of life, can learn from.